Great working with this boutique. Had some questions on the different kinds for the dress but she answered them all! Fast shipping and great quality! Can't wait to wear it as a dress for my friends upcoming prom! The dress is absolutely gorgeous! The detail is exquisite. The material is of very high quality and the standard size is very true to size. The customer service is outstanding and the questions are answered very quickly and accurately. 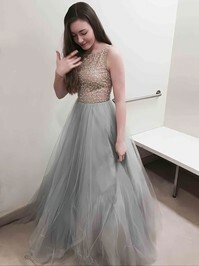 Have good experience on MillyBridal.